Quiet, beautiful top floor condominium pied-a-terre at the newly-remodeled. Ore Station Lodge is just a 30 second walk to the gondola in the heart of downtown Telluride. Relax on the exterior deck facing Ballard Peak and enjoy the common area BBQ grill on site. Take in the unobstructed views of Ballard Peak and Ajax with an après ski chardonnay from your deck, or if you prefer, an ice-cold martini at the Cosmo bar–a mere twenty second stroll from your front door. Backyard lawn with BBQ. Brand new furnishings throughout the home. The home is appointed with everything that you need to make this your home away from home. 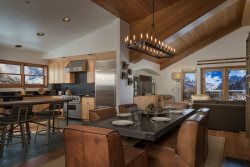 From new, crisp bedding, TVs in each bedroom, to comfy sofas in the living room to a fully outfitted kitchen - this is a perfect Telluride getaway. Remodeled kitchen with large island. Separate dining area with seating for 4. Living room has 2 designer sofas with custom rugs.